Wikipedia is one of the first places that students often go to get some background information on a topic they're researching. Besides just going to Wikipedia.org and entering a search, there are some other ways to explore the content of Wikipedia. Here are five ways that students can visually explore Wikipedia's content. Wiki Mind Map is a resource for visually exploring Wikipedia. Wiki Mind Map is essentially a search engine for Wikipedia articles that uses the Google Wonder Wheel concept. Enter a search term into Wiki Mind Map and it will generate a web of links to Wikipedia articles about your chosen search term. Wiki Mind Map will also include related search terms within your web. Wikihood is a neat way to explore the world in your web browser. Wikihood is one part Wikipedia and one part Google Maps. There are two ways to explore the world using Wikihood. You can simply browse the map by scrolling and zooming in on locations then clicking on placemarks. Or you can use the search box to enter the name of a place (like Mount Everest) or the name of an event (like the Battle of Fort Sumter). Whichever way you choose to explore Wikihood the display format is the same. The map appears on your right and the Wikipedia entries appear on your left. You can expand and read the full Wikipedia entry within Wikihood. Wiki Field Trip is a neat website for exploring Wikipedia entries about places around the world. Here's how it works, enter a city name on Wiki Field Trip and a series of placemarks appears on a Google Map of that city. Click on any of the placemarks to read the Wikipedia entry for that location. The Full Wiki offers an interesting mash-up of Google Maps and Wikipedia entries. The Full Wiki takes Wikipedia entries and places them on a Google Map. Your chosen Wikipedia entry is also presented side by side with a Google Map. The Full Wiki is essentially geolocating Wikipedia entries. 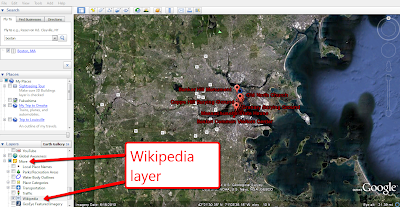 One of the standard layers in Google Earth is the Wikipedia layer. 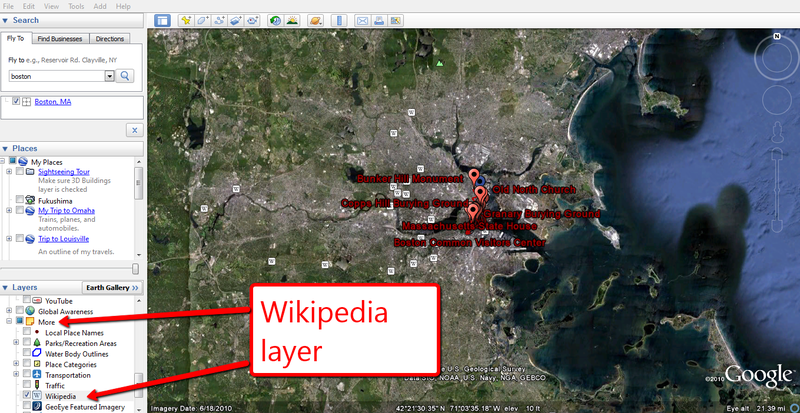 Students can turn on the layer to access Wikipedia entries that are related to the places they're viewing in Google Earth. To turn on the Wikipedia layer open the "more layers" drop-down menu then select "Wikipedia."